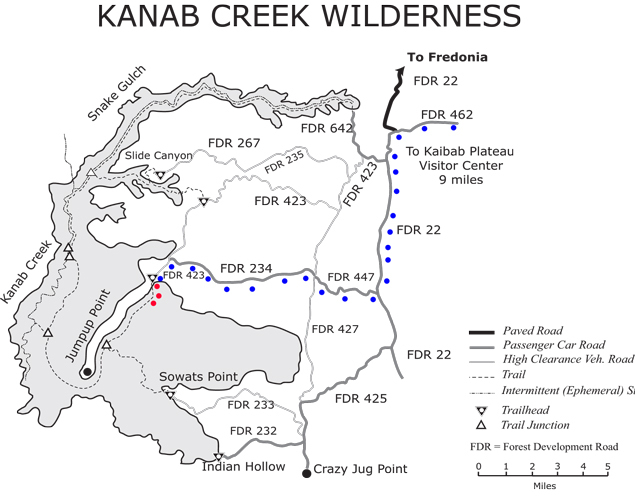 The Kanab Creek Wilderness is located about 30 miles south of Fredonia Arizona in the northwestern part of the state. While on an extended camping trip to the North Rim of the Grand Canyon, my wife and I spent one day out on a ride to the wilderness area to see what it was about. This map shows our route(blue dots). Our base camp was setup near Jacob Lake northeast of FDR 462. FDR 22 is appropriately labeled as a passenger car road and would probably remain that way through all but the worst conditions. I am not sure that I would agree with the labels on FDR 447 and FDR 234. I do not think that I would attempt those roads without having 4WD available if they were wet. The FDR 447 and FDR234 legs of the route are through pretty empty and remote country. This is looking west from the 234 road. It can be seen continuing in the distance. The Kanab Creek Wilderness boundary is several miles beyond the green tree line. Most of the trees here are pinyon pine and juniper. This is the view down to Jumpup Cabin and the trailhead at the end of the 423 road. It took us about an hour to arrive here from FDR 22. The cabin was originally constructed in 1906 and restored in 2009. The sign at the side of the cabin noted that "Through the years the cabin has served as a Forest Service Ranger Station and as temporary quarters for local cattle ranchers". The interior of the cabin is divided into two rooms. It was very clean and there was a small wood stove. The cabin is open for use. I have read that at one time it was being considered for the Forest Service "Rent A Cabin" program. We did not see any indication that was its current status. The trailhead for the Ranger Trail is just below the cabin. This trail may have originally been constructed to allow the transfer of livestock from one grazing area to another. 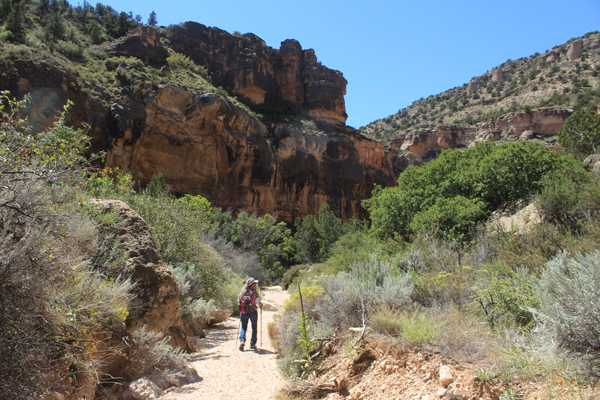 We decided to load up our day packs and take a short walk down into Jumpup Canyon. The upper Jumpup Spring was just 1/2 mile or so down the trail. Once on our way, we found the trail surface to be somewhat overgrown. There had not been a lot of recent traffic. That was not surprising. It was August--not a recommended time to be out on the trails at this location! After a couple of long switchbacks down from the cabin, the trail gradient eased. We were grateful that the drainage itself was not the path. Just past a large rockfall, the trail crossed over to the east side of an intersecting canyon. There, against the cliffs and hidden in a cluster of trees was Upper Juniper Spring. It was very shady and cool around the spring. Except for a bit of floating algae the water in the concrete trough was clear and cold. An older wooden trough lay to the side. The year 1933 was scratched in the concrete. I was very tempted to take a drink from the spring, but did not. I did not hesitate to dip my hat. Just below Upper Juniper Spring, the canyon walls came together a bit and were steeper. The trail seemed to be in the wash. This was getting interesting. The trail soon left the wash onto a bench above the creek. 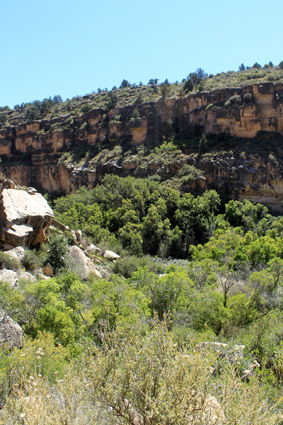 Rather than becoming deeper and narrower, the canyon opened up. It was getting warmer, so we said that for this day we had ventured far enough down the Ranger Trail. We both thought that this would be a fun trail to come back to and spend more time. The Ranger Trail apparently runs for 17 miles before dropping into Kanab Creek. 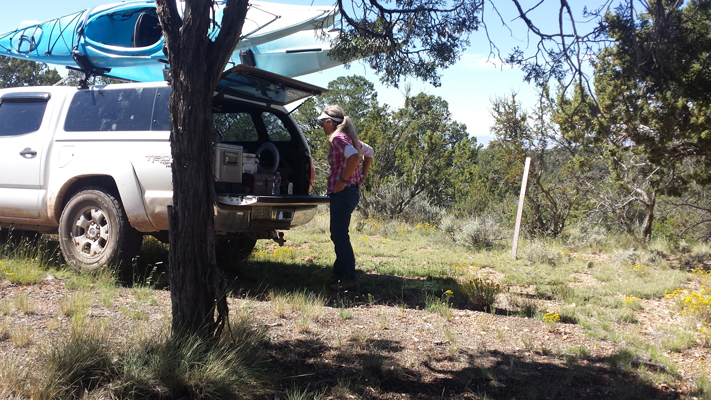 After a quick break in the shade of Upper Juniper Spring, we made a quick return to our truck. Lunch was under a Juniper tree on the 234 road. On the 447 road we had passed a sign "Brow Monument 2 Miles". For some reason, I was not curious enough at the time to drive over and see what it was about. After we returned home, and looked it up, I wished that I would have gone over to it. The Brow Monument is one of the original metal disks that had been installed by the John Wesley Powell Survey Expedition of 1872. It still survives in its original position.